Tomorrow, I celebrate seven years of living in Australia. Yeah, seven years. It’s been good. Actually, no, it’s been amazing. I got to do things that I didn’t think I’d be capable of and I got to visit places that I never thought I would. As most of you know, I officially gave up my Philippine citizenship last year. While I am grateful to Australia for taking me in, the Philippines will always be my homeland. 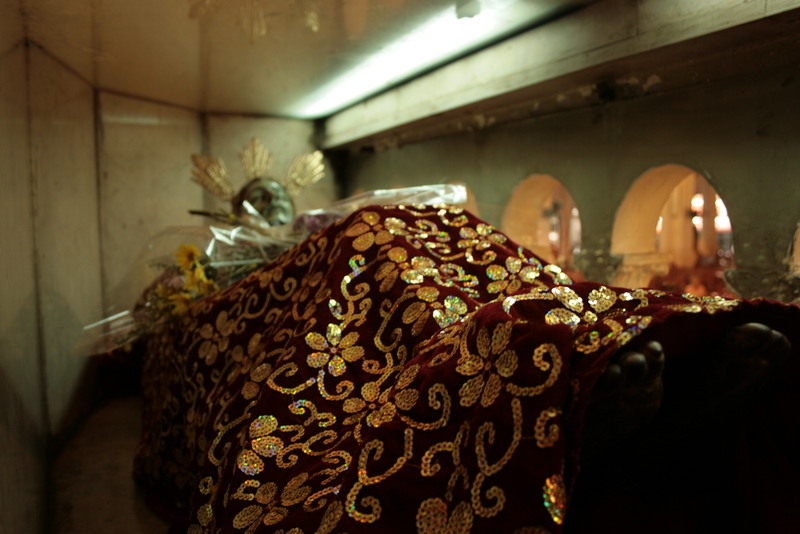 This is the statue of the St. Sepulcro at the Paco Church. As a child, I have very vivid memories of lining up to say a little prayer at the foot of Jesus. Back then, I was too short to reach up and touch the statue’s feet and so either my mom or my grandmother would carry me as I kissed His feet. I need only to conjure up the memory of the scent of that particular part of the church and I am transported back to my childhood. When I visited our old home town with my grandmother a couple of years ago, it was the first time that I was actually able to reach Jesus’s feet without having to be carried by an adult. 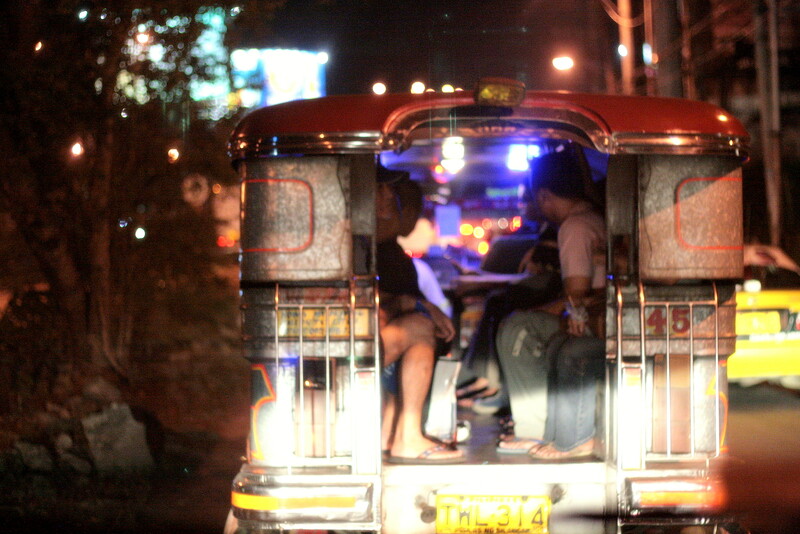 The streets of Manila will not be the same without the jeepney. All through my school life, I’ve ridden these noisy, carbon monoxide emitting, traffic rules breaking mode of transport. Until of course, the FX made it’s appearance on the roads. My best jeepney ride was when some friends and I rode on top of the jeepney. I think we were on our way to (or was it from?) Imelda Falls. It was absolutely fun! Mt. Pinatubo. How can you not fall in love with that view? 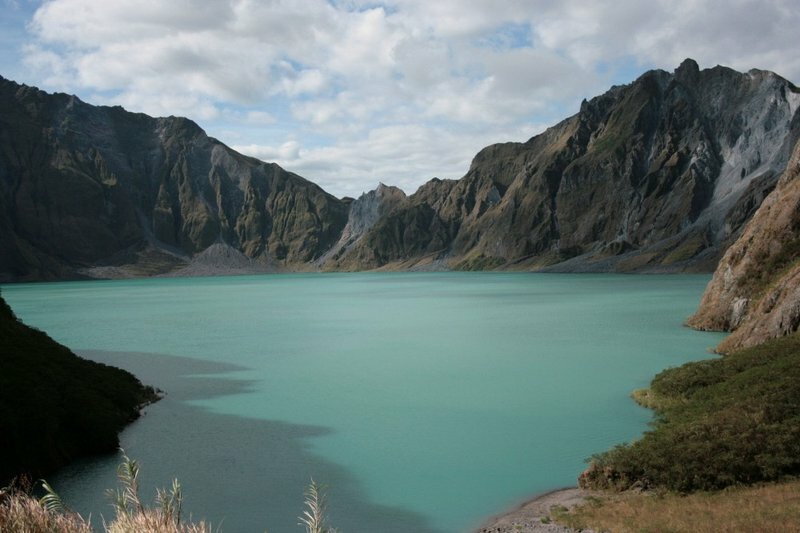 In one of my visits back to the Philippines, I dragged one of my cousins to do the Pinatubo trek. It is a must-do when in the Philippines! Not quite the Harbour Bridge but good enough for Manila. My grandmother and I rode the ferry from Sta. Ana, Manila to Pasig. What an experience! I loved it. 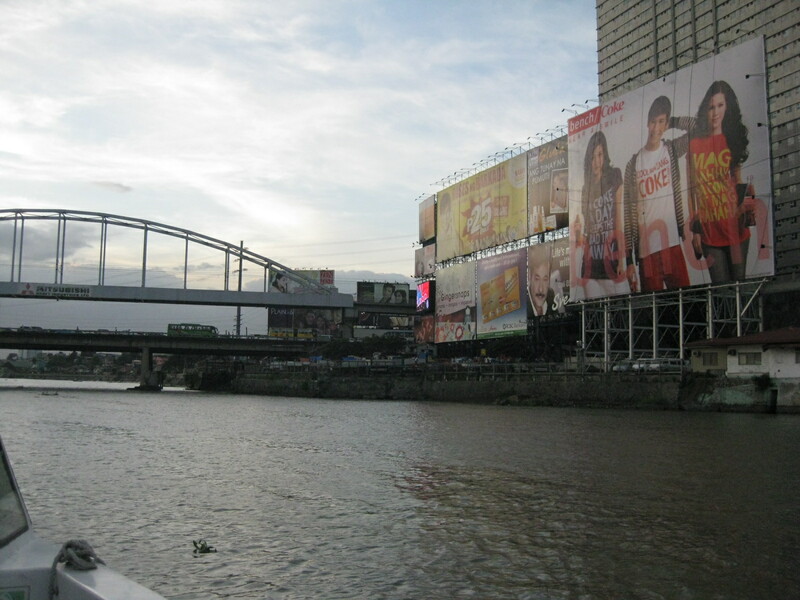 I just wish there would be a stronger push to clean up Pasig River to its former glory. And I’m sorry but I really think those big billboards are eye sores. We have a saying: “Wag maging dayuhan sa sariling bayan.” My family has been living in Taytay, Rizal for nearly 20 years now and I still haven’t seen most of Rizal Province. Again, on one of my many trips back to Manila, my mom and I went to the much talked about restaurant Balaw-Balaw in Angono, Rizal. 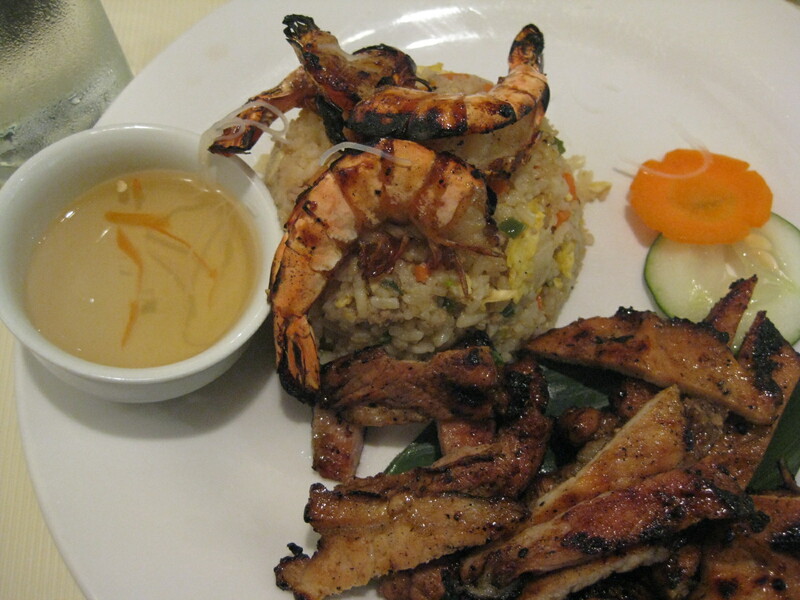 They serve good Pinoy food (see photo above) and they also have art works all around the place. This is one of my favourites. It just has that Pinoy fiesta feel. 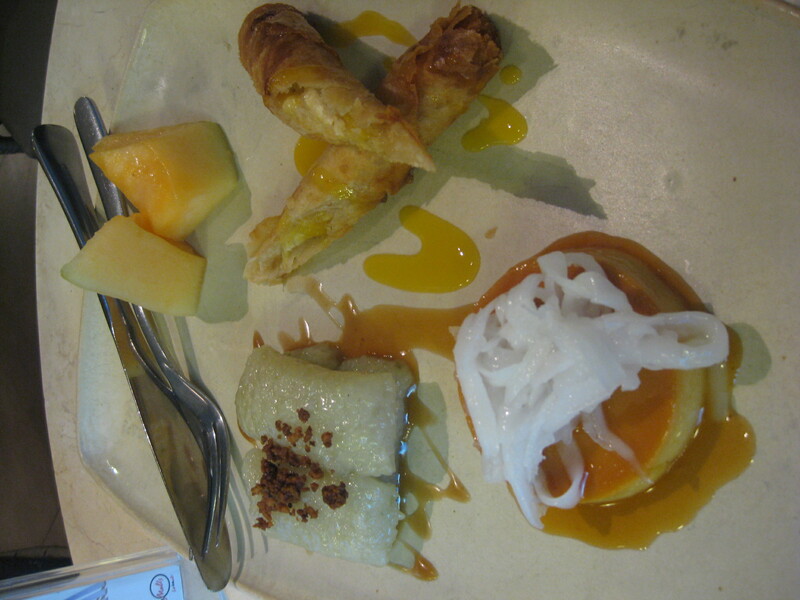 Just because I can, more yum-yum food! 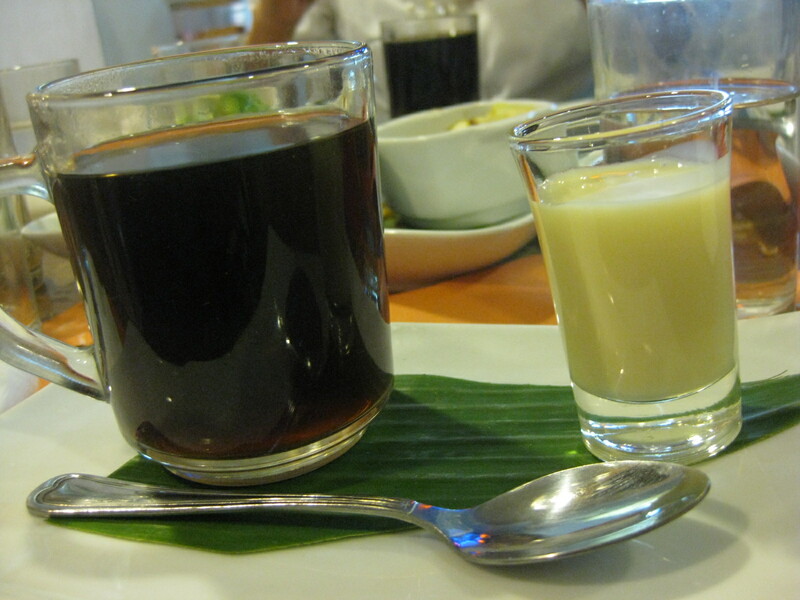 Brewed coffee served with condensed milk. No sugar needed. I still think Philippine coffee is one of the best in the world, if not the best. Again, I’m being biased. 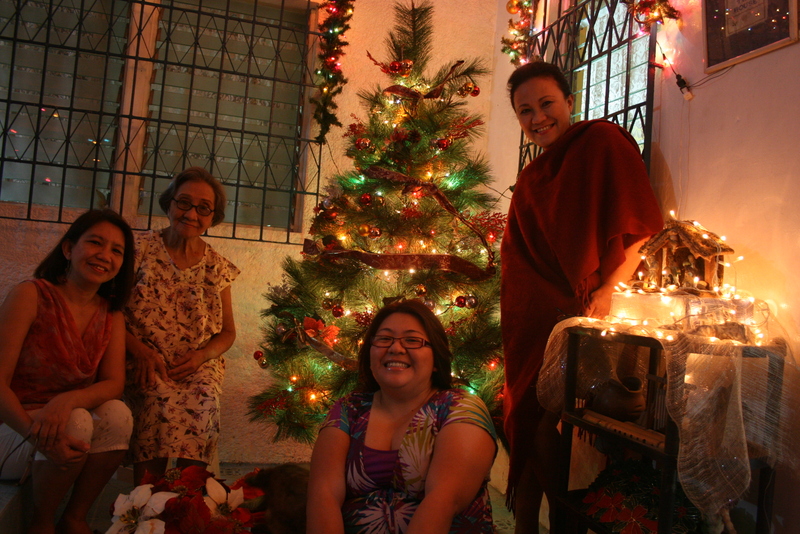 Nothing beats Christmas in the Philippines. Spending it with family is priceless. Now, let’s forget London and Paris and Sibiu and Dresden for a moment because this December, Manila’s where I’m headed. I can’t wait! Inspired by this post over at the Hogwarts Professor’s site. When you buy tons of Harry Potter-related merchandise (both official and unofficial) and don’t feel guilty about it. Why not? Because you are a hard-working member of the labor force and you deserve the reward, geddemit. When you have all 7 books in the traditional format because you love the smell of paper, Kindle be damned. When you own the Harry Potter books in languages you don’t even understand (ehem). When you have digital downloads of all 7 books as a back up, on top of your 7 hard bound copies. When you have attended at least one Harry Potter event dressed up as your favorite HP character, tropical temperature notwithstanding. When you’ve taken public transport (LRT/MRT, jeepney, bus, London subway) dressed as your favorite HP character to go to that Harry Potter event (I have. Many times). 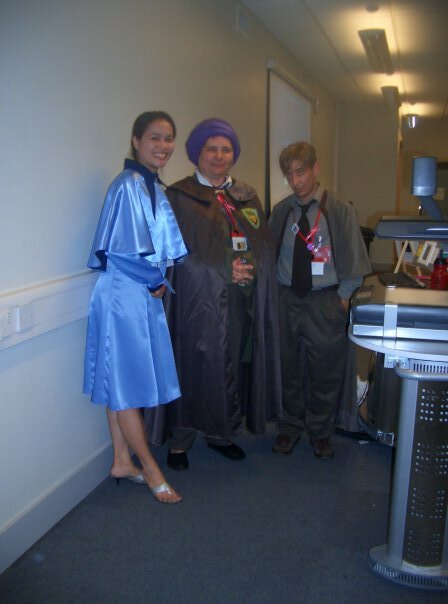 You dress up as Fleur Delacour in an HP event and when Muggles ask you which school you go to you immediately reply with, “Beauxbatons Academy, monsieur!” Bonus point: when foreigners ask “do they speak French in the Philipines?” upon seeing you in your Fleur uniform. You feel like Madeline the French schoolgirl everytime you wear that Fleur get up. Bonus point: you can recite “we love our bread, we love our butter, but most of all, we love each other” maxim of that French school girl with matching French accent. While wearing Fleur’s uniform. You don’t mind the whole gender-bending cosplay as long as you can dress up as the Potions Master. 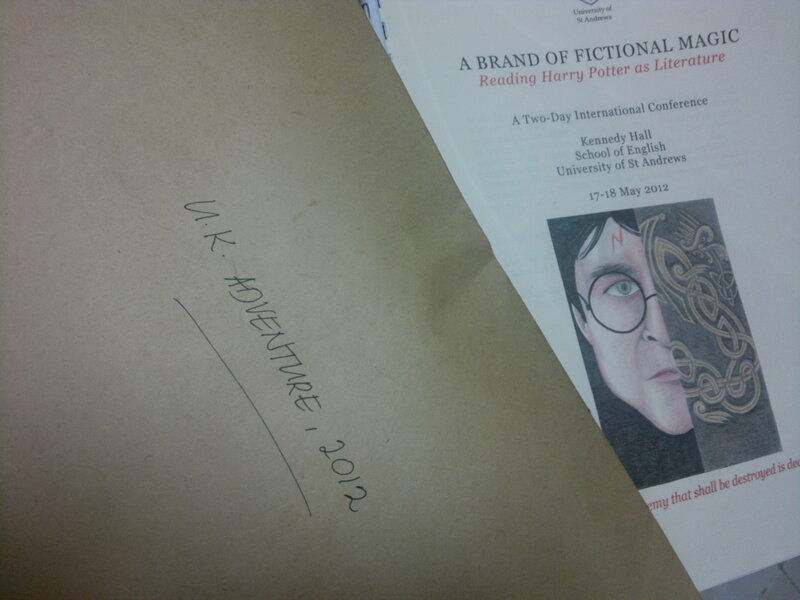 You’ve done the whole Harry Potter pilgrimage, or at least planning to do it in the very near future. You know how to fold your arms like the Potions Master. Complete with sneer. You. Speak. Like. Alan. Rickman. You don’t mind being called a witch by strangers (them carrying pitchforks is a different story, though). You’ve actually played Quidditch in real life (I was a Keeper, yes). You wish the local liquor shop would sell Firewhiskey. 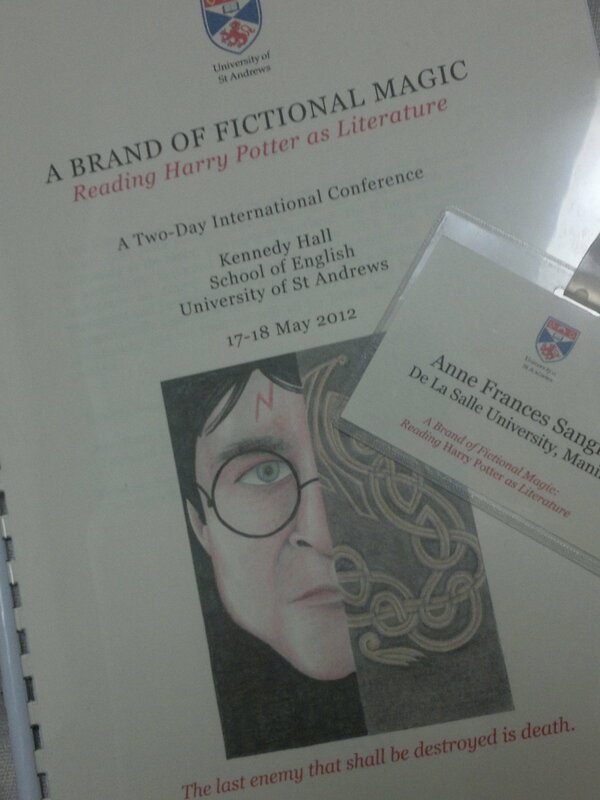 You’ve published at least one essay about Harry Potter. 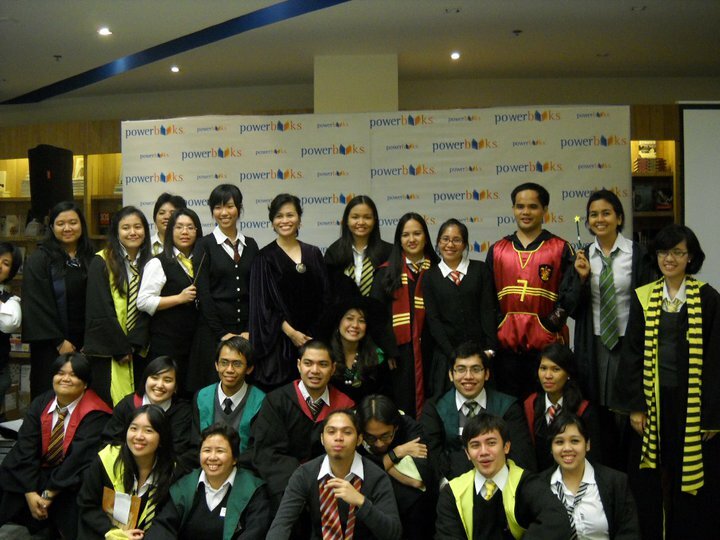 You host a Muggle event and you can’t help but insert one or two Harry Potter-related words/situations in your spiel. You know who the Hogwarts Professor is. 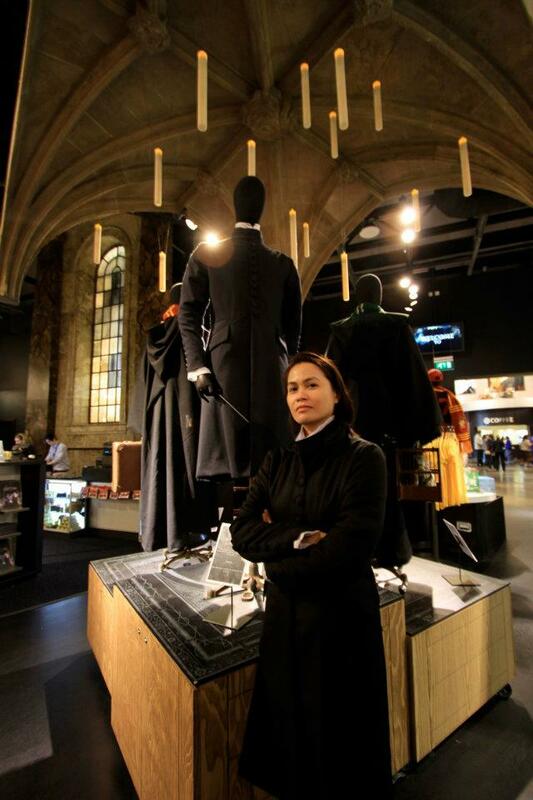 You’ve shaken hands with the Hogwarts Professor. You know what happened to Steve Vander Ark, probably have even met him in person, and you now shake your head with everything that has happened post-lawsuit (tsk, tsk, tsk). You understand Harry Potter vis-à-vis Joseph Campbell’s Monomyth. You get the whole Time-Travel concept in Harry Potter & the Prisoner of Azkaban. I mean really, REALLY get it (hello, tenseless view of time!). You know that Harry Potter and the Deathly Hallows has many loopholes but you can only accept this critique from a fellow HP fan and will fiercely argue with a non-fan if it comes to that. You secretly laugh when “fans” call Harry’s ex girlfriend as “Cho Chan” (duh). You snicker when “fans” have only seen all 8 film adaptations but have never read any of the books (boo! *snicker, snicker*). You know given the HP timeline that the Other Minister was most likely John Major, but you actually imagined Tony Blair for the post. You actually know who John Major and Tony Blair are. You understand why Harry Potter shouldn’t fall under the Children’s literature category given what has happened in the later books, but you cringe at the idea of putting it under YA literature, given the current YA template. You know wizards rule and werewolves drool anytime. All the time. You are a member of a non-profit, non-governmental organization that is devoted to spreading the love for Harry Potter (and promoting passion for reading in general). I’m sure there’s more but as it is a Sunday, my brain’s not working in full capacity. Add your ideas into the cauldron, my dear reader. August 20 has always been a red-letter day for me; well, for the past 18 years that is. 18 years ago, I was involved in a vehicular accident that took the life of one of my friends, and caused another to be too dispirited to continue with her undergraduate studies. I can tell you all the wee details that make up the entire tragedy, for yeah, I still remember everything as if it all happened yesterday, but I won’t. I’m too tired to narrate the story. I’m too old. I’m too far away, and far too different from that Frankie. Whatever remains, though, stay the same. The memories, for some reason, have retained their too real quality despite the passage of time. I can’t seem to shake ’em off. I remember what I had for lunch 18 years ago. I remember what I was wearing. I remember my headband. I remember the car. I remember the roads. I remember the people—-strangers trying to help, the doctors, the nurses, the cops. Anyway, since I’ve been revisiting my old Multiply blog of late (yes, because Multiply is on the verge of death, I’ve been trying to figure out how to save all my precious blog entries from that particular social networking service), I chanced upon my old August 20 entry from ’07. It’s the story. So if you don’t mind, I’m pasting it here for posterity’s sake. You do have the option of stopping right here, right now. 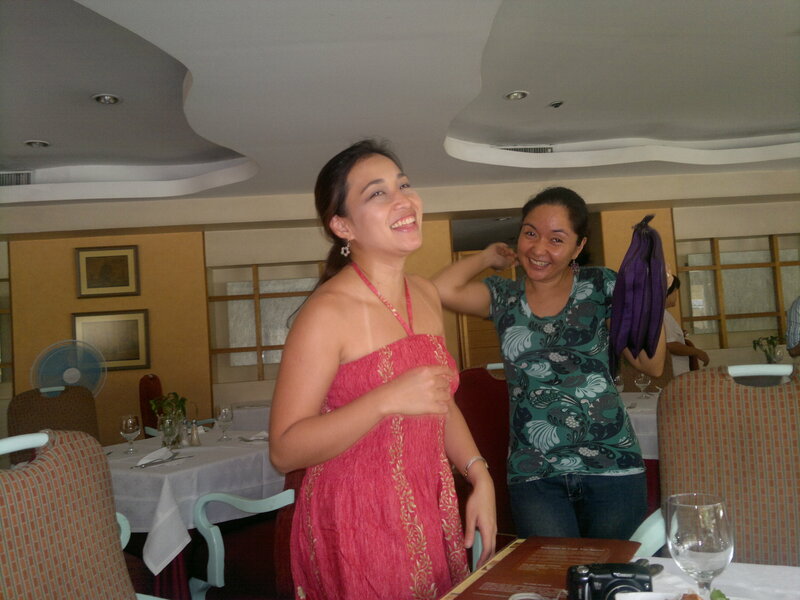 13 years ago today, right about this very hour, I was getting ready to leave for Antipolo with Laarni and Che-pie, friends and thesis mates from DLSU-Manila. We were on our way to start Day 1 of our documentary about cloistered nuns in a monastery somewhere in Antipolo. All our bags were packed in the trunk of Che-pie’s Toyota and all our gadgets—microphones, cameras, V8 tapes, TV set, tripods, gels, numerous cables, head phones, etc were safely secured along with our luggage. It was a good, sunny day, and we were excited, ready for the month-long immersion in what was to be a project of a lifetime. Since it was going to be a month-long program, the group decided to do some last minute shopping for supplies at SM North EDSA. We even had early lunch at Dunkin Donuts. I can still recall what we had for lunch. Che-pie and Laarni had doughnuts of the Bavarian kind while I had Bacon and Cheese croissant. It was a good, light, early lunch. Eveything seemed to be good and just fine. Well, as all plots must twist at some point, ours did a sharp curve that threw us off. Well, quite literally if I may add. It was around noontime when it happened. I don’t know the exact time, but I recall the time to be 1:20 when we were being transferred by some good samaritans to a cab to bring us to the nearest hospital. We had to leave the wreckage behind—-bags, cameras, wallets, everything. What’s more important was, well, the three struggling souls inside the cab. I wouldn’t say this storyteller was really struggling, that’s too melodramatic. She couldn’t even feel pain. Heck, she didn’t even know how serious it was until she saw her reflection on the rearview mirror—her broken headband precariously dangling from her blood-soaked hair. Still, no pain. She even had the gall to sing; I don’t know, maybe as an attempt to pull everyone’s spirits up. Che-pie was screaming “my eyes! my eyes!” in the front seat (the good samaritan was cradling her). Laarni, next to me, though unscathed (she was the one driving Che-pie’s car) was too shocked to do or say anything. One can only imagine what she was feeling at that time, she with no scratch at all, transporting two bleeding friends, and leaving the combined wreck of our car and the truck that we hit. Upon arriving at some hospital, this storyteller still had no idea as to the gravity of the situation. She thought that after a few dabs of alocohol they’d all be up and about to continue their journey. It was so surreal she thought she was dreaming. But as all tragedies go, no amount of alcohol can stop the bleeding at a snap. Che-pie had to be transferred to St. Luke’s and Laarni had to go with her. Good thing Laarni still had the presence of mind to make decisions at that moment. She even took this storyteller’s watch, I don’t know why. Maybe she thought she could pawn it somewhere to pay for the emergency bills, I’m not really sure. So this persona was left in that hospital to be stitched up good. It wasn’t that painful. You won’t really feel the needle, thanks to the anaesthesia. The scars on the forehead are still there, a reminder of an afternoon that will never be forgotten. She was branded a “survivor” over at the muggle university. Everyone, from professors to counselors to classmates to technicians to people she barely even knew wanted to hear the story, the tragedy. An instant celebrity, she became. Mang Norman the technician, to this very day refers to her as “yung pumutok ang noo.” She became a fashion icon too. Well who would have thought berets can be worn in the Philippines despite the heat? Those berets covered the scars, yes; even the uneven cut of hair the doctors hastily did prior to the stitching. But no beret can quell the story. Especially if everyone wanted a piece of it. 13 years ago, Laarni decided not to continue with her studies. She was too traumatized to even finish her last 1.5 units. She coudn’t finish the thesis. And who could blame her, really? That was that. She simply returned the watch to the owner, said goodbye, wished her luck, and left, not to be seen again. 13 years ago, Che-pie passed away. The university decided to give her family her diploma anyway. She had a seat reserved for her at the PICC during that term’s graduation. 13 years ago today, this storyteller made a decision. She will not graduate on time, oh no. But she will finish what the group started. She’ll do it alone. It’s going to be difficult, yes. But nothing in life is easy. It will be done. It’s fascinating how something so unexpected can change a person’s life for all eternity. And it’s even more fascinating to note that the scar that was initially abhorred still serves its purpose, something like a Remembrall. People can’t easily see the scars on my forehead, thanks to make-up indeed. But no amount of make-up can cover up the past. Heck, I don’t even conceal them anymore. Truth be told, I rarely notice the scars anymore. It’s still there, oh yes. But I’ve become so used to it being there it’s no longer fanciful. It has become a part of me. And hey, who would’ve thought 13 years ago that right about that moment, a British woman was on her way to conjuring a boy with a similar-looking lightning-bolt shaped scar on the forehead? 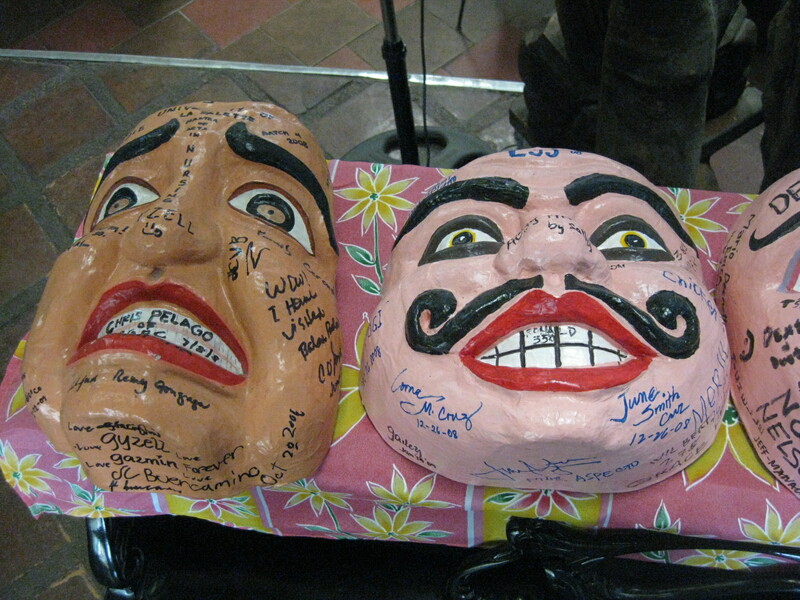 The story is still the same, but the storyteller is not quite. That’s the way all things go, I guess. I still do wonder, you know, about some things. I wonder about Laarni and how she’s been for the past 18 years. We never kept in touch, you see. I wonder about Che-pie’s family and how they tried to cope with the loss. Last I heard Che-pie’s dad passed away a couple of years or so after she died. Must have been difficult for her mom. I wonder about the nuns, the subject of our study. While I did finish the documentary (I even gave them a copy of the final cut), I never went back to the convent after it was all done. I couldn’t bring myself to. I couldn’t see the point. Now I look at my forehead and my hairline. My face hasn’t been the same since that day. You probably wouldn’t notice (thanks, in large part, to good make-up), but they’re there. Time may have softened the scars, but it wouldn’t wash out the memories. With apologies to Ms. Rowling. . . The scar had not pained me for eighteen years. All was well. 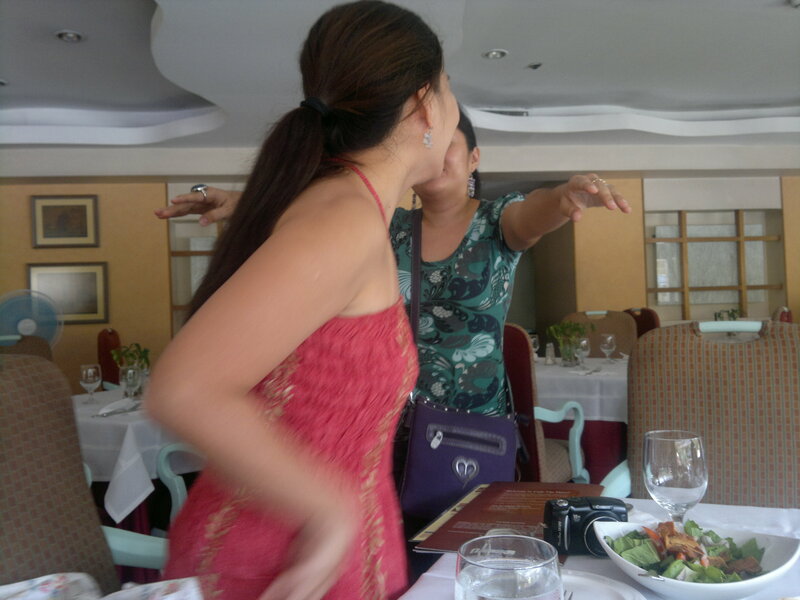 Because it’s been over a month since she left to look for Big Foot, and I’m certain the adjustment she has to go through must be brutal for someone who’s set in her ways, not to mention someone who has deep roots back here in the Philippines, here’s a wee entry, mostly photos, from the surprise despedida lunch with Abbey two weeks before she left. I told her it was going to be lunch for the two of us. Little did she know. . .
I’m good with surprises. And yes, I love surprising people. And I love making plans, especially clandestine ones. Most especially plans that involve my friends. 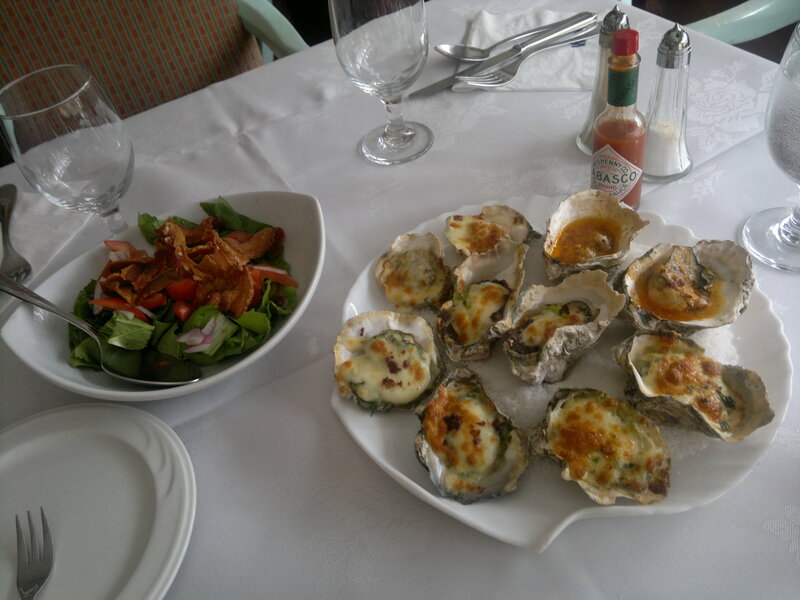 I even conspired with the restaurant’s (Via Mare Oyster Bar at Greenbelt) maître d and a few of his underlings to make the plan even more believable. I reserved a table upstairs (quite an elegant place to have lunch, really) “for two”, which was my code for “four people.” So when I got there (I was first to arrive, naturally) and told them I was that person who reserved for four but it was meant as a surprise, the maître d said, no, insisted, “ah, you reserved for two!” and added a knowing smile my way. From left to right: Edwin, me, Abbey, and Inez. Happy foodies. 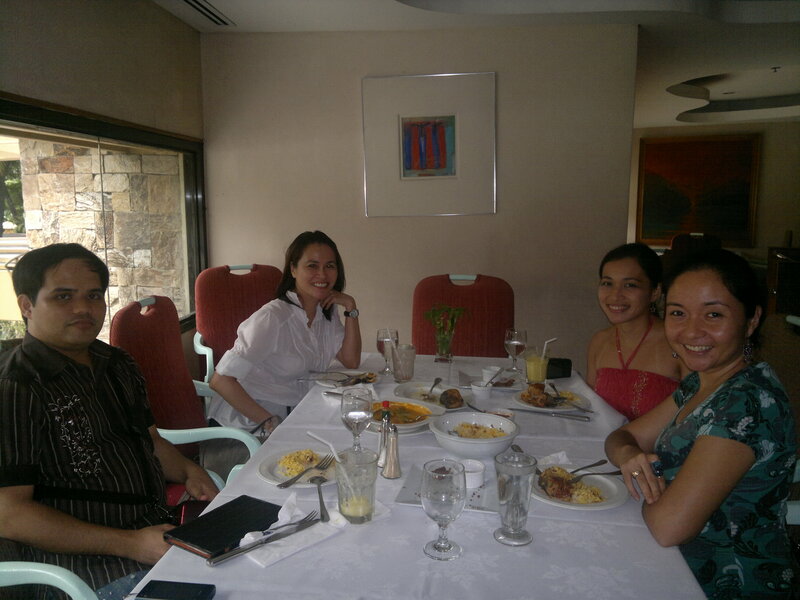 Abbey and I had lunch around 1130, and Edwin and Inez arrived at 12nn. 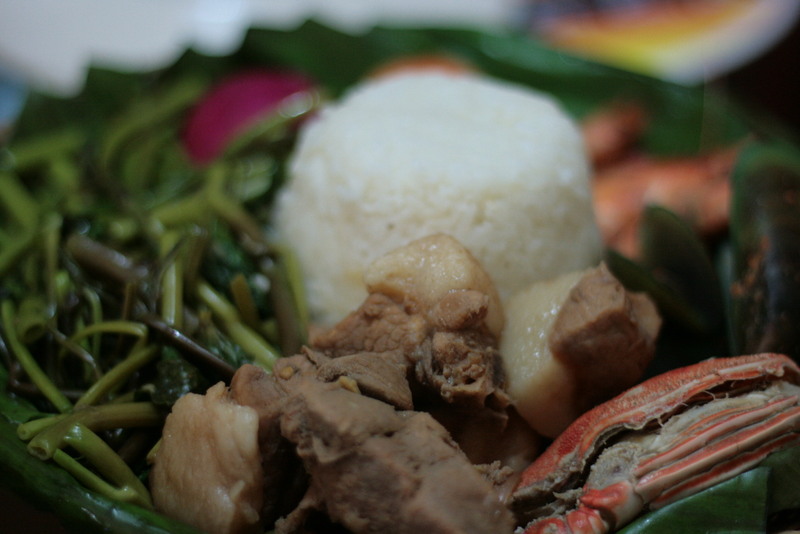 We had oysters, crispy adobo flakes, ensaladang bagnet, rellenong bangus, and kare-kare. We also had something like a screening of “The Best of Abbey”, a video compiled by Cherie from Abbey’s closest and dearest from PHP. Abbey had to leave by 230 pm, but Inez, Edwin and I stayed for merienda. I just had to have their bibingka with laguna cheese and salted duck egg. And coffee, of course. We left a little after 430 pm. Yes, that was some extended lunch. That always happens when you meet your dear friends after many months, if not years, of not seeing each other, right? So now, plans are a brewin’ for another friend’s comeback come December (hello, Buttercup!). Too bad Bubbles won’t be around by then 😦 Unless of course she finds a way to apparate back here in Pinas for some good old inebriated fun, hahaha! And oh, Bubbles, it’s your turn to blog, hahahaha! 😀 We miss you! Since tomorrow is what I consider to be my personal D-Day (work-wise, at least), post-MacG’s repairs (it took Apple over a month to repair the whole thing), I decided to do some major tidying this morning. Out with the junk I’ve accumulated for the past 7 months or so. And I have accumulated a lot of junk, believe me. Typical of major cleanups, I was once again reunited with some stuff I am quite certain I will have difficulty parting ways with. I am no hoarder, oh no, but there are just some things that I cannot bring myself to throw away, no matter how trifling they may seem to another person. 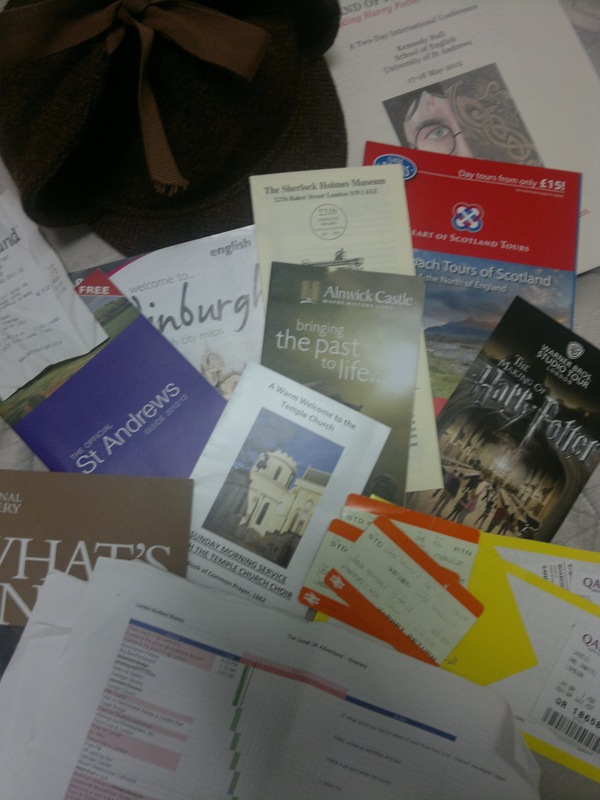 Clockwise from Top left: My Sherlock Holmes’ deerstalker hat , conference program, maps and souvenir guides from Scotland, the Sherlock Museum, Alnwick castle, the WB Studio tour, Qatar Air tickets, national rail tickets, spreadsheets, National Gallery guide, map of St. Andrews, receipt from a shop at St. Andrews, map of Edinburgh. Just look at the stuff I’ve kept from that Great U.K. Adventure a few months ago. Maps (you know how crazy I am when it comes to maps), train tickets, plane tickets, souvenir guides, even receipts from Information Centres where I bought loads of Scottish fudges and refrigerator magnets. . . . I’ve kept them all. If you look at the bottom part of the photo, you will see several pages worth of spreadsheets. Those were our three-week itinerary for both England and Scotland, our budget sheets on a daily basis, and my personal list of stuff to bring (down to the last pair of socks, yes). The photo doesn’t even show all the documents I had to bring with me: conference letters and schedule, visa requirements, bank transactions, official University memos and travel grant letters, and of course, several copies of my conference paper (I’m rigorous that way. I guess all academics are trained to be such). I’ve decided to put everything inside a large Manila envelope for safekeeping. Who knows when I’ll need to go over some receipt or document once again, right? I have no plans of holding on to all these stuff forever, no. Give me a few years, maybe. I mean, I still haven’t even thrown away all my junk from my first London escapade of ’07, believe me. Everything’s still well-hidden in my cabinet, ready for any trip down amnesia lane. I guess this is me trying to bring back order into my life. The past 10 months had been crazy, what with all the writing and the research, the preparations and the fantasizing, the hassles of getting ready, the excitement and the jubilation that came naturally with all of it. . .and then the letting go once it was all over. Until we meet again, my magical I.D. 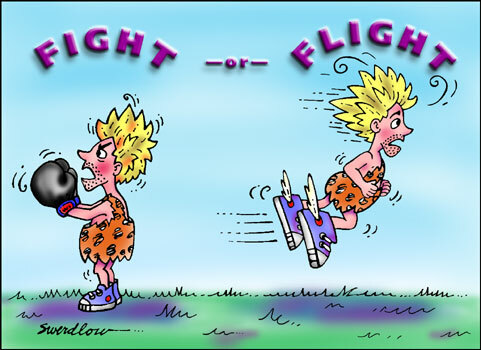 I’ve been on an extended lag post-Adventure. Life hadn’t been normal. Well, tomorrow’s its comeback, whatever ‘normal’ really means. I just hope this is the last time I will be pining for a return to normalcy. Once everything is over, I am definitely leaving normal and will never look back. I can’t wait ’til everything is over and done with so I can come back to my magical life, the only life I am looking forward to living. Melodramatic much? Maybe. It’s the normal rearing its ugly head, I tell you. I’m not good at being normal. I choose. . . . I haven’t blogged about anything for weeks now. Well, nothing earth-shattering happened with me anyway, save for the torrential monsoon rains that battered my hometown and other towns these past few days (and I really don’t want to blog about this tragedy, no), and the awful flu (strange since I just had my flu shot last month) so debilitating I could not even get out of bed without having those nasty dizzy spells. I’m also still patiently waiting for my laptop’s homecoming so I’ve been on withdrawal from my online self for about a month now, yes. I haven’t done anything worthwhile, truth be told. I’ve been a total bum and I’m not proud of it. Things will have to change soon, as soon as Monday, in fact. I have to make up for lost time. I have to prepare so many things. My sabbatical leave is about to end in a few weeks and I’m actually looking forward to teaching once again. I need to write a ton of things, academic stuff, oh dear gods in Olympus, and I will need a major miracle to be able to finish everything. Part of me, a huge part of me wants to just drop everything, buy a ticket, and go somewhere far away. Getting a visa was never a difficult task for me so I’m confident I can fly to wherever my heart desires (or wherever my wallet agrees to go to). But is it wise? Definitely not. It will be irresponsible of me to do that, no matter how much my soul longs for it. It will just be another form of escape, you see. It’s not the courageous path. I must admit I’ve been weak, so weak for years now. I’ve only been pretending to be otherwise. But after months of reflection and self-analysis (bordering on paralysis even), I realized it’s time for me to stop dilly-dallying and to just get on with it. Just face my fears and fight my inner demons head-on. Enough with the excuses. Que sera, sera. I guess this means all travels will be indefinitely grounded starting today. All distractions will be ignored. Ermitanya mode on. Seriously, I love that word, ermitanya. There’s something so mystical about it, not to mention a sense of quiet and calm. I’m ready for a different kind of pilgrimage. Now where the heck is my walking stick? Him: G’day. Are you tired? Me: Nope, not really. Why, what’s up? Him: My girlfriend is coming out here in two weeks and she needs to go out more often. Me: You should take here her to the gym to meet other women. Him: I don’t know. One time, I got her to ride my ex-wife’s push bike but I just left her in the dust. She didn’t like it at all. Me: Well, I have to force myself to go to the gym so you’ll just have to encourage her. Silence. I keep on walking on the treadmill, waiting for him to say something. Me: So where is she from, originally? Sydney? Newcastle? Him: Oh no. She’s Thai. She’s coming from Thailand. Me: I can’t speak Thai, you know. Him: That’s alright. She speaks a little English but she’s a bit shy. Me: Has she been here before? Him: Yes, this is her second visit. Me: Have you been to Thailand? I’ve only ever been to Bangkok. Him: Yes, I’ve been to Bangkok. I didn’t like it very much. But I’ve been to Chiang Mai. I liked that place. I was also going to go to the Philippines but I never got around to it. Me: Ah, the Philippines. See, that’s where I’m from originally. His voice trailed off. I wanted to ask, “Exactly look like what?” But I think I sort of figured out what he wanted to say. I didn’t exactly look Asian, or so I’ve been told. Remember this post? Because I am Asian, I can sort of tell the subtle difference between Thai, Vietnamese, Indonesian, or Filipino. And it’s usually because of the intonation of their speech rather than the language itself. To non-Asians, particularly to Australians and probably most Caucasians, the best way to tell if an Asian is Filipino is through the accent. Apparently, we sound American. Also, to them, all Asians look the same – Chinese. Him: You know – and I don’t want to sound insensitive – I tell my girlfriend that I’m not a walking wallet. I’m not rich, I tell her. Me: I know what you’re trying to say. Filipinas are in the same generalised category too. I once met a physiotherapist in Muswellbrook who was so amazed to have finally met a Filipina not married to an Australian. I take no offense. Some are and some aren’t. By this time, I’d finished my time on the treadmill and was ready to move on to the stationary bike. So I smiled and said, I need to get going and that I’ll see him around. He said goodbye and walked off to chat to friend who spotted him at the gym. So what was I supposed to do in two weeks’ time? Meet up with him and his Thai girlfriend? At the gym? I wasn’t really sure. He didn’t even introduce himself and I never thought to tell him my name either. Strange. Very strange indeed.